The Papua New Guinea Defence Force has withdrawn a platoon serving in Hela after two of its members were recently shot to death by locals, Hela police commander Michael Welly says. 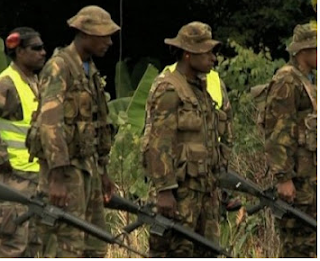 The soldiers have been brought back to their base at the Murray Barracks in Port Moresby. Military helicopters transported the 11-man platoon (originally 13) which was escorted by soldiers from a unit at the Goldie River Barracks. They will be investigated by the military for the death of their comrades and why they elected to stay in Hela after their posting at Komo Airport had ended. Welly said there were no soldiers manning the facilities allocated for the military at the newly-built Komo Airport. He said the two soldiers – one from New Ireland and one from Eastern Highlands – were killed by locals. “The soldiers were part of a platoon who came across a fight between two tribes. As the fighting was within the vicinity of their camp, the soldiers intervened to stop the fighting from spreading,” he said.